Certified SeQual Eclipse 5TM with autoSAT® Personal Ambulatory Oxygen System. The Eclipse Portable Oxygen Concentrator is the only small, lightweight, low maintenance portable oxygen system that provides both continuous flow and pulse dose oxygen therapy consistent with accepted standards of care. The internal auto-recharge power cartridge of the Eclipse enables easy movement between AC power outlets without interruption of oxygen therapy. The SeQual Eclipse eliminates the need for long lengths of tangled oxygen tubing to move about. The Eclipse gives users the freedom for extended travel without the fear of running out of oxygen. Just plug the Eclipse into your auto accessory (lighter) outlet and travel as far and as long as you like. Not only can you take the SeQual® Eclipse Portable Oxygen Concentrator in your car, but you can also take it on airplanes, cruise ships, trains, buses and every other modes of transportation. *** Upgrade*** The Sequel 5 Eclipse can run on both Continuous flow and Pulse flow settings while plugged into the AC outlet in your car, unlike the Eclipse 3. On September 12, 2006 the FAA approved the SeQual® Eclipse Portable Oxygen Concentrator for commercial airline use. Be sure to check with your airline for any restrictions/requirements for traveling with a portable oxygen concentrator. In between an AC or DC power outlet? Not a problem! 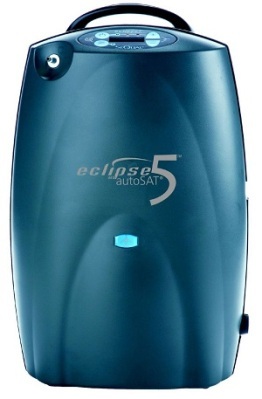 The internal auto-recharge power cartridge of the Eclipse 5 Concentrator keeps the oxygen flowing for up to 5.1 hours. Includes: 1 Battery, AC Power Supply, DC Power Supply, Cart, Accessory bag, English Manual and a 1 YEAR full warranty. We are currently out of the Sequal 5. You will get the Sequal 3 if ordered!